Hello Fabricistas! 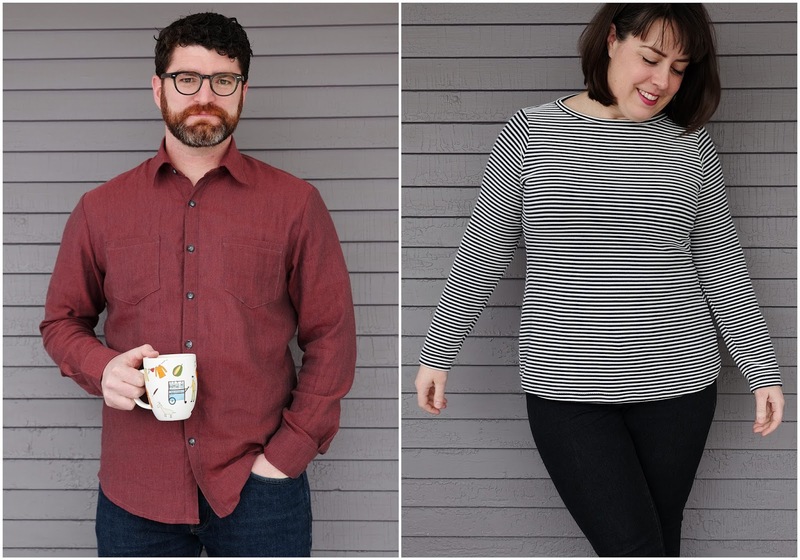 It's Meg from Cookin' and Craftin', back with a couple garments made from some of my favorite TNT patterns and gorgeous Fabric Mart fabrics. As I did a few months back, I've made something for myself, but also something for my husband! 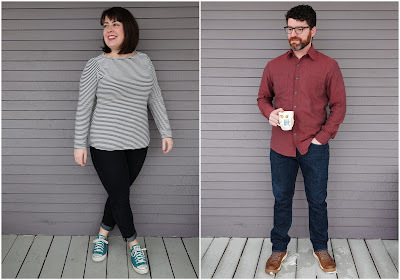 I chose patterns that I consider TNTs: the Cashmerette Concord t-shirt for me and McCall's 6044 for Tim. First, for the dude, a slightly modified McCall's 6044 buttondown shirt. I've made this pattern for him so many times that I no longer look at the instructions. 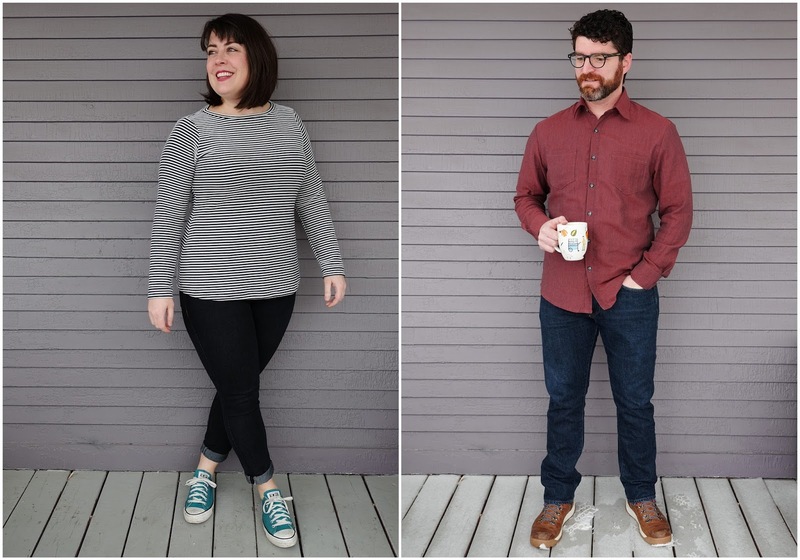 It works in a wide variety of fabrics and we've got the fit just how he likes it. The fabric I used for his shirt is this cotton flannel twill shirting. I love the brick red color, which is created by terra cotta threads in direction and charcoal grey threads in the other. The flannel is quite lightweight, but super soft and has a cool texture! A little bit shifty and easily unraveled, but it makes for a nice, comfy shirt. I made a few change to McCall's 6044 (same that I made for his last one), namely to add a yoke, make the sleeve a 1-piece, and add tower plackets. Since the fabric was so lightweight, I decided to do french seams on the sleeves, side seams and armholes. French all the seams!! I topstitched everything with charcoal grey thread, which I think looks cool. For me, I made a long-sleeved Cashmerette Concord t-shirt. I was reminded of how awesome this pattern is a few weeks back when I made a dress from it... the fit is just fabulous. This is a size 16 C/D with a high neck, medium length and long sleeves. The only changes I made were to lengthen the sleeves so I could hem them since they're normally finished with a band and do a 1" full bicep adjustment. The fabric I chose is this killer navy and white striped poly/rayon double knit (no longer in stock, sadly, but Fabric Mart has plenty of other double-knits for your viewing pleasure!). It's three-dimensional, with the white stripes being raised off the surface of the fabric. I love the texture of the fabric, although it made it a little bit difficult to stripe match across the seams because the two sides seemed to want to interlock with one another rather than lay with the stripes straight. I'm so happy with both of these pieces! Both will fit in seamlessly in our handmade wardrobes! Beautiful work, Meg; as always. Button ups are so satisfying to sew, and stripes--don't get me started on how much I love them. Made by a Fabricista: Sewing for little people!